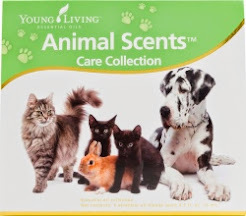 Natural, safe & effective methods using 100% pure, therapeutic-grade Young Living Essential Oils to care for your own cats, dogs, birds, fish, horses & other animals. Getting Started with Essential Oils! When you're out on the trail, or even in your backyard on a holiday weekend, and something happens to your pet, there are sometimes difficult challenges to be faced. The nearest veterinary clinic may be miles away, you could be miles from home on a weekend afternoon, or you may have no way to transport your injured pet. What do you do? A kit of Young Living Essential Oils may be the answer! Here is a simple list of some of the most common essential oils that can be kept available at home, or carried along with you in case of a pet emergency. This list is merely a partial list, which consists of oils that cover most conditions in the least number of bottles. There are many other oils that may be substituted if your pet is more tolerant of one oil over another. 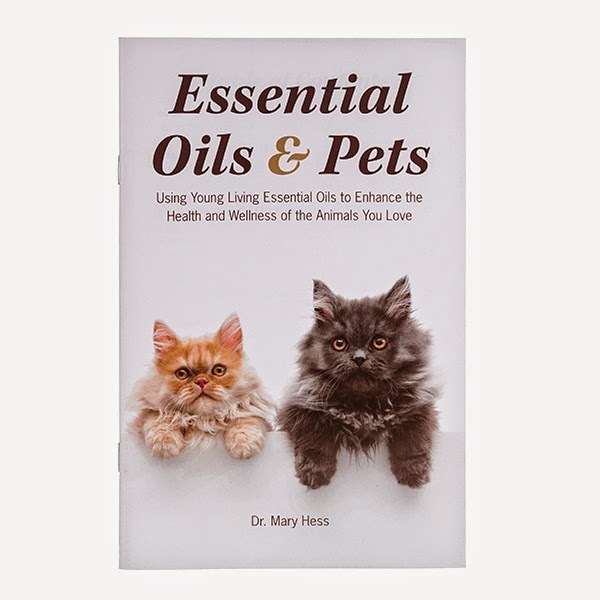 The emergency kit can be used for all pets . . . . and, with proper dilution, all pets can benefit from the wonderful essential oils that nature has provided for us. ~ Purification is useful for external parasites such as fleas, ticks, and mosquitoes. It provides protection from infectious agents as well. Because of the ease of transmission and the number of ticks carrying diseases, it is especially important for use with ticks. ~ Thieves is the strongest antimicrobial blend available. The oils of clove, rosemary, cinnamon, and lemon have been shown to be more effective than antibiotics. It is useful in wounds, abrasions, and lacerations. It is the primary oil for dental problems. It is used as a safe alternative to chemicals to clean areas that are contaminated. It is even safe for kittens and puppies. ~ Melrose is useful in conjunction with R.C. and Raven for respiratory infections. If Thieves in not tolerated well, this blend can also be used for wounds, lacerations, and abrasions. Use this blend for respiratory and urinary tract conditions. It is very useful for cats that have bladder inflammation that are not responding to conventional therapy. It is used for chronic feline urinary syndrome as well. It is also the best oil for sinus infections ~ especially the chronic feline rhinosinusitis. ~ Raven is another respiratory and urinary tract essential oil. It is more powerful than and covers oils not found in R.C. Together the two blends complement each other. ~ Di-Gize helps with most gastrointestinal conditions. Diarrhea, vomiting, and internal parasites are all treated with this combination of essential oils. Often, nutmeg or ginger can be added to give added nausea relief. ~ M-Grain provides relief from headaches that follow an upper respiratory tract infection due to sinus pressure caused by colds, sneezing, and coughs. ~ PanAway provides relief from pain often experienced by older pets who suffer from osteoarthritis. It also relaxes the muscles, ligaments, and tendons. It can be used alone, or with other pain relieving oils. It is very effective on acute injury. Using a moist towel over the area increases the effectiveness of the oils. ~ Relieve It has also been found to be effective for pain, especially acute pain. Alternate use with PanAway has shown to increase the range of pain relief in general Often this blend is combined with PanAway to help with severe sinus pain as well. 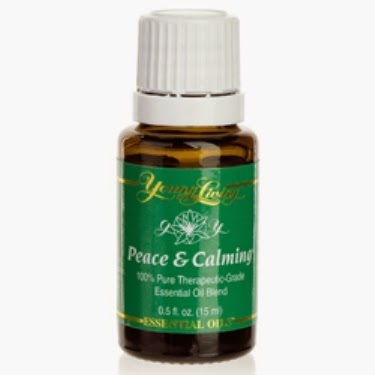 ~ Peace & Calming is just one of the blends used for stress, fear, anxiety, and behavior problems. 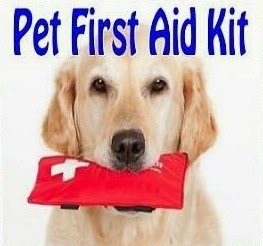 It is used with other methods of behavioral modification and training to help calm both the pet and the pet parent. Because it reduces anxiety in the pet parent (which is a percentage of the stress component of the pet), it also helps to reduce the anxiety and stress of the pet. The blend is also useful with an injured pet, since its calming effects help the pet so other methods of care or transport to an emergency facility can be rendered. It has also been useful in cats that are resistant to other forms of treatment for stress-related urinary issues or excessive grooming. These are the basic emergency kit essential oils that every pet parent should have handy. They are versatile and cover many conditions. The essential oils come in 5 ml or 15 ml bottles, however you can also make your own smaller travel sizes of each oil with 5/8 ml dram sample bottles, which are great for taking along on short outings. Using only a drop or two is sufficient in many cases, therefore the smaller bottles are easily transported in a backpack, purse, or with a handy carrying case that clips onto your belt or bag! Should you wish to get started with your own oils and products, I recommend that you enroll as a wholesale member in Young Living by purchasing the Premium Starter Kit, which gives you the Everyday Oils, a bonus oil called Stress Away, a Home Diffuser, as well as samples to try or share. This is an excellent investment in your health, as well as the health of your animals. You also have the option of joining as a Retail Member, as opposed to a Wholesale Member, so it is completely up to you. There are also options for monthly Essential Rewards orders, which earn you points that you can spend on additional products, as well as promotional items every month that you can earn for free, just by shopping for what you already need. Thieves essential oil blend was given its name because of a small group of thieves that used these oils to protect themselves from getting sick as they robbed the dead and dying during the plagues of 14th century Europe. This blend of oils is shown to be antibacterial, antifungal, and antiviral. It is highly effective when used at the onset of candida, thrush, and flu symptoms. It is used for abscesses, hoof rot, thrush, skin fungus, infections, ringworm, and laminitis. Weber State University studies have shown that, when diffused, Thieves kills 99.96% of microbes in as little as 12 minutes. Thieves Toothpaste, with added Thieves essential oil, makes a wonderful poultice for scratches, rain rot, and thrush. Horses respond exceptionally well to essential oils. Although they are large, they often will respond greatly to even smaller amounts of essential oils. A common belief amongst animal lovers and animal professionals is that in the wild, all animals roam and find plants that contain beneficial essential oils that they need. Chewing and stripping bark from trees, rolling in certain plants, eating grass and leaves, smelling plants while grazing, and even wandering through certain aromatic plants all expose an animal to nature's wonderful plant oils. Even domesticated animals, such as cats and dogs, often eat grass as a way to soothe an upset stomach, and / or to make themselves vomit to rid themselves of whatever is upsetting their system. 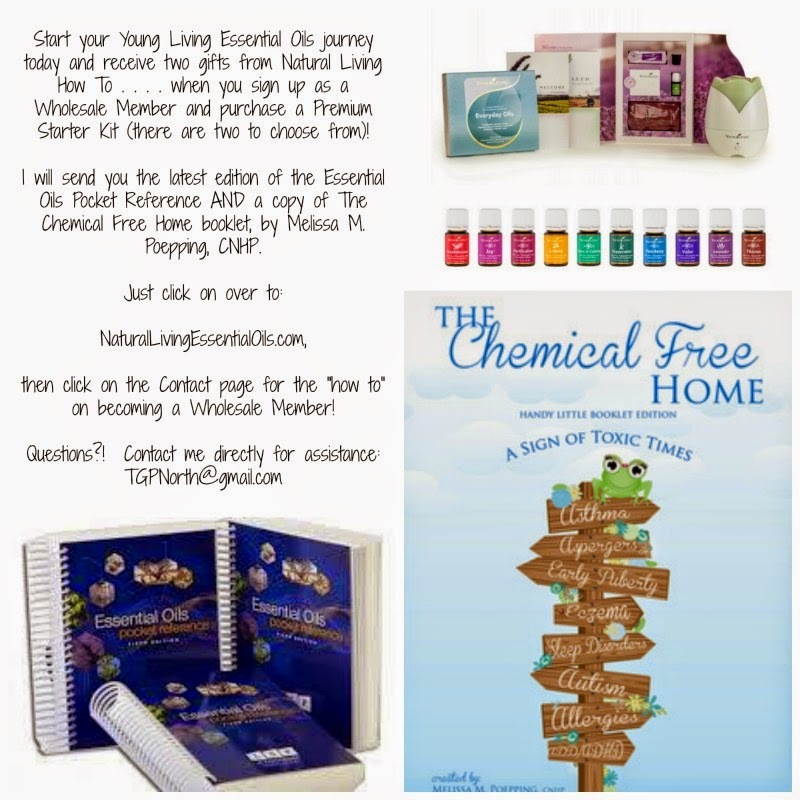 July Promotion ~ Join as a Wholesale Member and receive two free gifts from me . . . . the Essential Oils Pocket Reference AND choose The Chemical Free Home OR Essential Oils & Pets booklets, as my thank you to you for starting your amazing essential oils journey! If you are like most pet parents, you love your animals and consider them part of the family . . . . and for good reason. Animals bring us laughter, joy, companionship, and love and are a meaningful part of our lives. That is why their health is so very important to us. 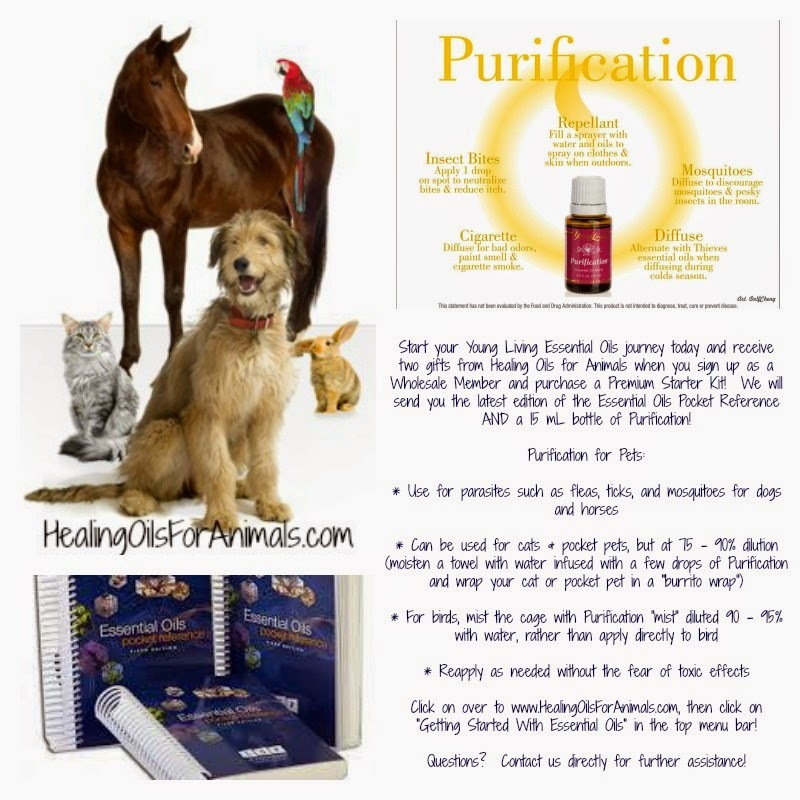 Young Living Essential Oils can be a powerful health tool to help you care for your animals. Before I proceed, I must emphasize that everything I write or share about Essential Oils is referring ONLY to Young Living Essential Oils, as they are 100% pure, therapeutic-grade essential oils that are guaranteed for purity and potency. You can only get YLEOs direct from an authorized distributor (which I am), and the company . . . . so, please do not run off to the health food store, or high-end grocery store and purchase oils that are of a lesser grade and quality, and that are not safe for ingestion or topical use! You may contact me directly with any questions or concerns regarding this difference. 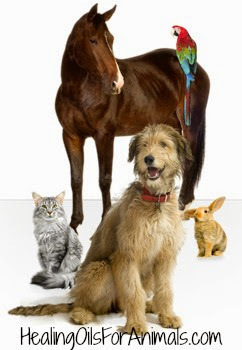 How Essential Oils (EOs) Benefit Our Animals . . . .
1. Supports Immune System ~ Essential Oils work on the cellular level to stimulate the body to respond to infectious agents. They impact the body by increasing the lymphocytes and improve the immune system response. Immupower, Thieves, Raven, and RC are some examples of blends that help support the immune system. 2. Provides Antimicrobial Elements ~ Essential Oils have been found to be more effective than some conventional antibiotics in eliminating infectious agents. The range of effectiveness includes resistance to viruses, bacteria (double resistant to pseudomonas infection, which affects dogs), parasites, and fungi (chronic unresponsive fungal infection, which affects cats). Clove, Lemon, Melaleuca, Eucalyptus, and Rosemary all have antimicrobial elements. 3. Eliminates Pain ~ Many Essential Oils relieve pain and can be used with a warm moist compress. The addition of moisture enhances the oils effectiveness. They are useful for bone, muscle, tendon, and ligament pain. Use with other modes of pain relief provides another option. Essential oils can be used more often than conventional medication and spans the gap that often occurs with oral or injectable analgesics. EOs stimulate endorphin release which activates pain relieving neurotransmitters. Post-surgery, the oils are also used to give pain relief. They can be applied topically on the area of concern or used orally with other pain relievers. Most of the time, the oils are used on an as-needed basis. Some blends and oils that help eliminate pain are PanAway, Relieve It, Mountain Savory, M-Grain, Peppermint, Wintergreen, Black Pepper, and Balsam Fir. 4. Provides Anti-Inflammatory Protection ~ Chronic disease is the result of inflammation in the body originating from injury, diet, infection, or toxins. Anti-inflammatory effects of the EOs provide the body a chance to heal from these bodily assaults. Thyme, Helichrysum, Wintergreen, Peppermint, and Balsam Fir all work as anti-inflammatories. 5. Reduces Stress ~ Pets experience stress much the way we do . . . . research has shown they are very similar to us in their response to stress, as well as the side effects caused by stress. Evidence of stress can be seen in litter box issues, excessive grooming, aggression (chewing things, breaking through doors, destroying rooms, etc. ), and appetite loss, just to name a few examples. Essential Oils give the pet parent a natural method to correct the issues and relieve the stress. Often, corrective behavior techniques are more successful when EOs are used in conjunction with environmental changes. Peace & Calming, RutaVaLa, TraumaLife, Gentle Baby, Valerian, Petitgrain, Lavender, and Roman Chamomile are some of the oils and blends that help to reduce stress. 6. Restores Sleep Habits ~ As animals get older they seem to have a harder time at night . . . . from signs of restlessness to having to go to the bathroom . . . . and their sleep habits suffer because of it. Some of this is due to pain or disease, but other cases are due to cognitive dysfunction disorder or senility. EOs can provide an alternative to euthanasia so quality of life can be maintained for some time. Antioxidant activity of the EOs is high, which help the body restore itself at night. NingXia Red, Longevity, BrainPower, and Clarity are the most commonly used blends for sleep disorders. 7. Improves Coat and Skin ~ As with other cells of the body, the antioxidant effects of the oils can restore health to the coat. The overgrowth of yeast or bacteria can cause various skin metabolism issues and the EOs provide a healthy environment for regeneration of the skin. Lavender, Geranium, TeaTree, Patchouli, Frankincense, and Myrrh are all good oils and blends used to improve the coat and skin. 8. Minimizes Upper and Lower Respiratory Infection ~ Cats are commonly infected with respiratory disease . . . . especially farm kittens. The use of Essential Oils in this circumstance is effective because bacteria, viruses, and parasites are sensitive to EOs. The anti-inflammatory effect is helpful in decreasing the secondary asthma that can occur in the cat. Bronchitis in the dog is another disease that is treatable with EOs . . . . left untreated, it can become a long-term condition. Decreasing inflammation and infection in the respiratory tract as early as possible decreases the severity. The EOs are also helpful as an early treatment resolution. The best oils and blends for respiratory infections are Lemon, Eucalyptus, Raven, RC, Rosemary, Ravensara, and Frankincense. 9. Assists in Digestive Challenges ~ Essential Oils provide a natural way to de-worm, are soothing to the digestive tract, assist in correcting garbage toxicity or car sickness, and improves digestion overall. They relieve nausea, diarrhea, indigestion, and gas. Peppermint, DiGize, Ginger, Nutmeg, Idaho Tansy, and Clary Sage work well with the digestive system. 10. Promotes Cardiac Health ~ EOs have the ability to improve circulation by increasing oxygen and nutrient delivery to the cells. The body is healthy and stronger. For improved cardiac health, Cypress, Grapefruit, Basil, Ylang Ylang, and Spikenard work best. 11. Balances the Endocrine System ~ The body needs to be aligned in order to function. Cats get hyperthyroidism while dogs more likely get hypothyroidism or Cushing's. The EOs keep the body centered to prevent hormonal imbalance and fine tune imbalance. Clary Sage, Fennell, Myrrh, and Lemongrass are the best for this. 12. Supports a Healthy Urinary System ~ Renal insufficiency and bladder stones, infections, and inflammation are common in pets. Essential Oils are helpful in restoring bladder health, increasing renal function through improved circulation and antioxidant activity. Raven, RC, TeaTree, Orange, Lemon, and Rosemary support a healthy urinary system. 13. Helps Lacerations, Abscesses, and Abrasions ~ Essential Oils are helpful in resolving infections due to injury and in the healing process. Lavender is especially useful for abrasions and burns, but Melrose, Geranium, and Rose are also helpful. 14. Supports Muscles and Bones ~ Osteoarthritis and anterior cruciate injury is common in the active dog and cat. As pets lie longer the issues of age-related changes are more common. EOs can be used to help give a better quality of life to your pets. There are many blends and individual oils that improve movement, help repair injury, and provide pain relief. Some of these include PanAway, Relieve It, Black Pepper, Peppermint, Balsam Fir, Wintergreen, and Mountain Savory. 15. Improves Oral and Dental Health ~ Pets need dental care as much as their pet parents. Part of this involves control of infection and eliminating pain. 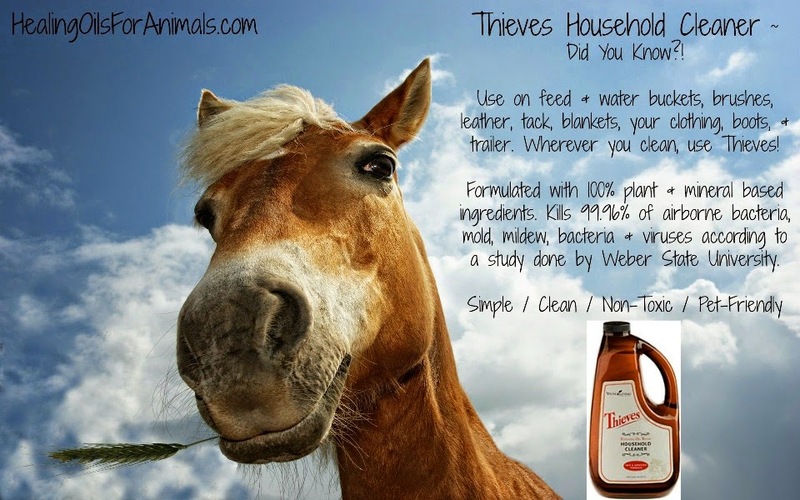 Thieves ~ a unique blend of antimicrobial oils ~ is very effective for this purpose. Using before and after normal dental care cuts down on the amount of bacteria buildup in the animal. As a preventative, Thieves will decrease dental disease return, while also working as a pain reliever after extraction. Along with Thieves, Mountain Savory, Peppermint, Myrrh, and Clove all help in your pet's oral and dental care. 16. Increases Alertness ~ As your pet ages, normal habits may lag, accidents may happen, and your pet may not enjoy life as much as he or she used to. Essential Oils have a profound effect on reestablishing old habits, especially Brain Power, Clarity, Cedarwood, Lemon, Sandalwood, Lavender, Vetiver, Orange, and Frankincense. 17. Protects Against Cancer ~ Essential Oils have been studied and have shown promising results in being a part of the cancer treatment plan. EOs have also been used for Melanoma in the horse and the dog with success. Frankincense, Palo Santo, Ledum, Spikenard, Citrus Fresh, Lemongrass, Lavender, Clary Sage, and Tsuga are some of the better EOs that help fight cancer. 18. Is a Safe Cleaning Agent ~ Many pets ingest cleaners . . . . especially those that drink from the toilet bowl or lick areas where cleaners are used. Thieves Household Cleaner is a safe alternative to the caustic cleaners. Lemon, Clove, Rosemary, Purification, TeaTres, and Eucalyptus are other effective agents. 19. Slows Bleeding ~ EOs can be used to stop the bleeding of a nail or pad. They are very effective and work quickly. Helichrysum, Cistus, and Geranium work best. 20. Eliminates Odors ~ Pets commonly have accidents in varying circumstances. Both younger and older pets of all types struggle with this. Other animals, like cats, often inappropriately urinate if stressed. Essential Oil blends have been used for these problems of odors and stains. Purification, Thieves, Lemon, Orange, and Citrus Fresh work best to help neutralize odor problems. Subscribe via Email ~ Each Post Delivered to Your Inbox! Treat Your Pets Holistically with EOs! Share the ♥ with Your Own Essential Oils! Copyright © 2014 · Healing Oils For Animals™. Simple theme. Theme images by Ollustrator. Powered by Blogger.